2 CD - Livret 16 pagesL'art et la manière de faire sans manières du très grand art.CD 1 PETITES FORMATIONS : THE ST. LOUIS BLUES (W.C. 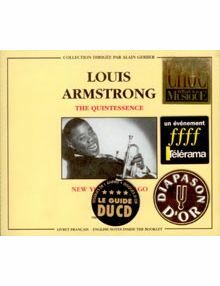 HANDY) AVEC BESSIE SMITH o HEEBIES JEEBIES (B. ATKINS) o CORNET SHOP SUEY (L. ARMSTRONG) o WILLIE THE WEEPER (M. BLOOM, G.V. RYMAL, W. MELROSE) o POTATO HEAD BLUES (L. ARMSTRONG) o STRUTTIN' WITH SOME BARBECUE (L. HARDIN) o HOTTER THAT THAN (L. HARDIN) o SAVOY BLUES (E. ORY) o WEST END BLUES (J. OLIVER) o BASIN STREET BLUES (S. WILLIAMS) o WEATHER BIRD (L. ARMSTRONG) o MUGGLES (L. ARMSTRONG) o ST. JAMES INFIRMARY (J. PRIMROSE) o TIGHT LIKE THIS (L. CURL) o KNOCKIN' A JUG (L. ARMSTRONG, E. CONDON) o DARLING NELLY GRAY (B.R. HANBY) AVEC LES MILLS BROTHERS o NOBODY KNOWS THE TROUBLE I'VE SEEN (TRAD.) 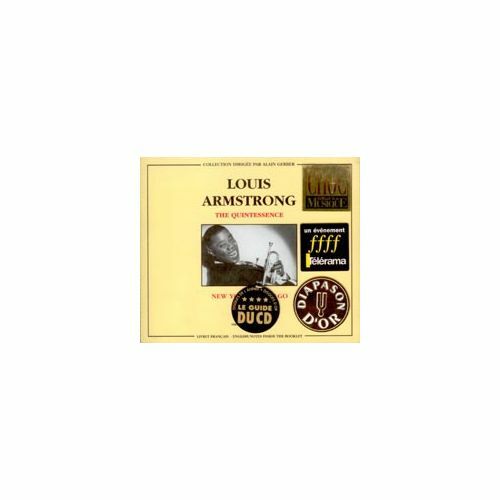 AVEC LE DECCA MIXED CHORUS o PERDIDO STREET BLUES (L. ARMSTRONG).CD 2 GRANDES FORMATIONS : I CAN'T GIVE YOU ANYTHING BUT LOVE (J. MCHUGH, D. FIELDS) o MAHOGANY HALL STOMP (S. WILLIAMS) o AIN'T MISBEHAVIN' (F. WALLER, H. BROOKS, A. RAZAF) o WHEN YOU'RE SMILING (L. SHAY, J. GOODWIN, M. FISHER) o ST. LOUIS BLUES (W.C. HANDY) o I'M A DING DONG DADDY (FROM DUMAS/P. BAXTER) o SWEETHEARTS ON PARADE (C. LOMBARDO, C. NEWMAN) o SHINE (F. DABNEY, C. MACK, L. BROWN) o CHINATOWN, MY CHINATOWN (J. SCHWARTZ, W. JEROME) o STAR DUST (H. CARMICHAEL, M. PARISH) o BETWEEN THE DEVIL AND THE DEEP BLUE SEA (H. ARLEN, T. KOEHLER) o LAWD, YOU MADE THE NIGHT TOO LONG (V. YOUNG, S.M. LEWIS) o MAHOGANY HALL STOMP (S. WILLIAMS) o I'VE GOT MY FINGERS CROSSED (J. MCHUGH, H. KOEHLER) o THANKS A MILLION (A. JOHNSON, G. KAHN) o SWING THAT MUSIC (L. ARMSTRONG, H. GERLACH) o STRUTTIN' WITH SOME BARBECUE (L. HARDIN) o I CAN'T GIVE YOU ANYTHING BUT LOVE (J. MCHUGH, D. FIELDS).DIAPASON D'OR - CHOC JAZZ MAN - ???? EVENEMENT TELERAMA - DISQUE D'OR LE GUIDE DU CD - "MEILLEURS DISQUES DE L'ANNEE LE MONDE"